The Neolia diffuser is a true revolution! Thanks to its EasyFuzz technology, the Neolia diffuser is very practical; no need to refill your essential oil dispensers! No more refills or daily cleaning. Top-of-the-range and powerful, the Neolia will diffuse your essential oils over large areas while retaining their properties thanks to its nebulisation diffusion technology. 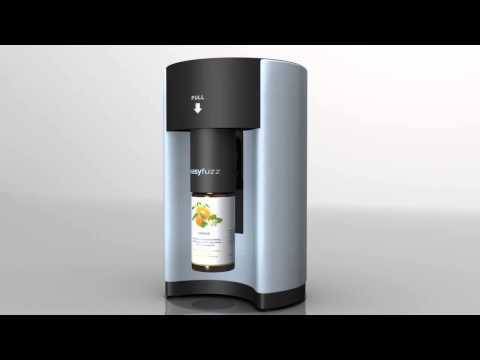 Now, simply connect your bottle to the device and enjoy all the benefits of essential oils. Adjustable and silent, the Neolia diffuser has a large diffusion area (it’s perfectly adapted to diffuse in large-volume rooms thanks to its very effective operation). Thanks to its nebulisation technology, the micro-droplets are distributed across a room of up to 100m² for several hours. For information, nebulisation is the action of spraying a liquid in micro-droplets through a nebuliser. The pump sends air into the glass container. This air projects the essential oils against the glass. The glass nebuliser then creates a cloud of micro-droplets that disperse throughout the room. The principle of nebulisation is based on the Venturi technique. In the nebulisation chamber, a high-speed airflow sprays the essential oils stored in the base of the glass container in micro-droplets. The lighter micro-droplets come out into the surrounding air via the cap. This cap has two functions: sound level reduction and diffusion axis. The largest drops fall back, to be sprayed again as micro-droplets. Each glass container is hand-blown and so considered a unique piece. Each one is checked to ensure its nebulising power. a nebulisation cap (a nozzle) and its nozzle with empty bottle. a second replacement nebuliser cap and nozzle with empty bottle. a mains adapter and USB cable. To assemble the diffuser, first remove the dropper from your bottle of essential oils. Screw the diffusion nozzle onto your essential oil bottle and clip the diffusion nozzle into the device. Finally, set the diffusion frequency over a chosen period. Works with all essential oil bottles on the market. Read the instructions carefully before use. To clean your diffuser, start by emptying out the essential oils. Then, pour in 1 tablespoon of diffuser cleaner and operate your diffuser for 3 to 5 minutes. You can clean your diffuser once or twice a month, depending on how you use it and the essential oils you use. Then, empty out the excess cleaner. Now, you can use your diffuser again. When not using your diffuser for more than two weeks, remember to put it in a dust-free place and have it cleaned later. The pump requires no maintenance. Do not activate the diffuser in the presence of children under 3 years or pregnant women. In a child's room, we recommend that you do it when they are not there, and at least 30 minutes before they come in.